How to move house with a cat is an exciting question but you cannot help but worry about how your cat will take to the change. With the exception of a few adventurous felines, cats generally become stressed when moved away from their familiar surroundings. It may sound funny but some cats form a stronger attachment to their territory than with their humans. The flurry of activity during the move may disrupt kitty’s daily routine. Cats by nature thrive on routine and predictability because this gives them a sense of security. Most cats will not like any disruption to the pattern in their daily life. Being suddenly uprooted from their territory and transplanted to a strange new environment can disorientate, frighten or make the cat nervous. This may result in the appearance of the various signs of stress and anxiety like vomiting, excessive vocalization, destroying furniture and attempting to escape. Some cats may manifest what is called fear-based house soiling by relieving themselves outside of the litterbox. Other cats may start acting out and becoming aggressive, hissing, biting and scratching their humans. They may pose a danger to their owners and to themselves. 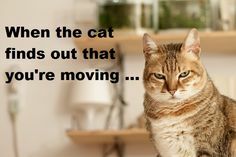 When considering how to move house with a cat, every owner’s goal must be to minimize the stress associated with the move. Good news is that this can be achieved! The most important thing is keeping the daily routine before, during and after the move. Even when you are busy packing and moving, try to stick to kitty’s regular feeding and play schedules as much as possible. The following tips greatly help to make the transition between the old and new home as stress-free as possible and allow your cat to settle in nicely. To transport a cat from the old place to the new, you will need a carrier. Choose one that is sturdy, has secure locks and good ventilation. The size should be just right for your cat to move around comfortably inside, not too small that the cat will feel smothered and not too big to overwhelm her. Spend time to help your cat get acquainted with the carrier. Place the carrier in a location that is accessible and keeps its door open to allow kitty to get in and out of the carrier to explore. You can place catnip or treats inside to entice your cat to get in. Later you can place her food dish inside. At other times you can place a familiar bedding inside the carrier to make her comfortable sleeping inside. This way the cat will see the carrier as a safe haven she can turn to. HELP YOUR CAT TO GRADUALLY ACCEPT THE CARRIER AS A SAFE PLACE. It is also best if your cat is comfortable having a harness on during the move. This gives extra security against your cat escaping and getting lost during the move. Choose a harness that fits your cat just right, snug but not too tight. Have your cat practice wearing the harness and walking around with it for a few minutes at a time until she is happy wearing it for longer periods. The process of carrier and harness training must be gradual. This is why you have to start doing it way before your moving date. Do not force your cat to get inside the carrier or into the harness against her will. Be generous with praise and treats when she is doing well with the training. Travel is a frightening experience for cats who have not been properly trained. It is best if your cat is already accustoming to the outdoor sounds and vehicles prior to the move. This will be one less stressor for her. You can practice riding in a car with the carrier and place her in the part of the car where there is least engine noise. Go for short rides first then slowly increase the time to longer rides. Designate one room in the old house where you can place your cat on the day of the move. This room must have secure doors and windows and no hidden escape routes. Choose a room that is relatively far from most of the activity and noise during moving day. CHOOSE A QUIET AND SECURE ROOM TO SERVE AS YOUR CAT’S HOLDING AREA DURING THE MOVE. About a week before the move, practice having your cat stay in this holding room. Place inside the room your cat’s food and water bowls, bed, toys, litterbox and the open cat carrier. Have her get acquainted with this room so she will feel safe and secure in it. 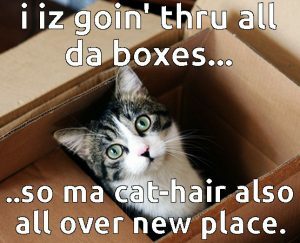 If you can get moving boxes well in advance, allow your cat to explore them under your supervision. A curious cat will want to inspect them. If the boxes familiar to become familiar to her then they are less likely to cause her stress as compared to having them show up suddenly and things moved around. However, remember to keep your cat away from the moving boxes when you are packing. Place kitty in the designated holding room so that you don’t accidentally pack her in the boxes with the other belongings. It may sound incredible but incidents like this can happen especially in the flurry of activity. If you have a feline who prefers living outdoors, it is best if you can encourage her to come in to the house. Keep her indoors at least during the week prior to the move to protect her from getting lost. Sudden activity, noise and commotion in their territory can make some cats leave. Provide toys and activity to keep your cat occupied and happy indoors. In case you are relocating to another country, inquire about local quarantine and animal laws in the new area. If moving to a different country, additionally, know the pet export requirements for bringing a cat into that country. Make sure that all these documents are in place. In case your cat is denied entry due to some lacking requirements, you will be the one to pay for boarding or the transport of the cat back to the country of origin. At the very worst, if your cat is denied entry, she may be put down. If moving to your new home requires you to travel by plane or other modes of public transport, inquire in advance to make sure they allow pets. Some airlines will require what is called an acclimation certificate to ensure that your pet can tolerate air travel. Make sure to comply with all requirements so that your cat will not be left behind. If your move will take more than one day, overnight accommodation may be necessary. Contact pet-friendly hotels or pet boarding facilities and make reservations in advance. Make an appointment with your veterinarian for a pre-move veterinary health check. Update all your cat’s vaccinations and parasite control medications. This is very important because you do not know what diseases or parasites might be present in your new surroundings so it is best if she is ready and protected. The veterinarian should also perform a physical examination and carry out necessary tests to determine if your cat is in good condition to move. If possible, avoid moving a pregnant cat, a nursing mother, very young kittens, very old cats and sick ones. They are the most susceptible to the effects of stress. If your cat does not have one yet, this veterinary visit would be a good time to have a pet microchip implant. This will serve as your pet’s permanent identification in case she gets lost during the move. A MICROCHIP IS PERMANENT IDENTIFICATION. Usually, a cat receives only a small amount of food on the day of the move to prevent vomiting or digestive upset. Consult with your veterinarian first if your cat has diabetes. 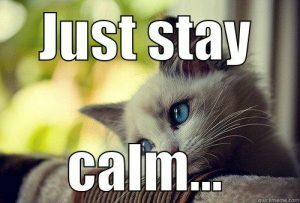 In case you have a cat with an overly anxious personality, go over with your veterinarian what remedies you can try to help kitty be calm and relaxed. Ask about swaddling, use of pheromones, sedatives or tranquillizers. Discuss with your veterinarian the health certificate and other pertinent travel documents that need to be filled up by the veterinarian if moving to a different locality. Also, ask your veterinarian for a copy of your cat’s clinical records if you are moving to a new place that is far away and would require you to see a different veterinary practice. If you have access to the new place, conduct an advance inspection of the whole house before moving in. Each room needs a check thoroughly making sure there are no holes the cat can fall into or nooks to get trapped in. Check for sharp edges that may cause injuries, loose small objects that may be swallowed or exposed electrical wires to get tangled in. Make sure that all the windows and doors lock securely. Investigate the yard for the presence of potentially poisonous plants or other toxic substances. These things are ideally done in advance because they can very easily be overlooked in the chaos of moving in. 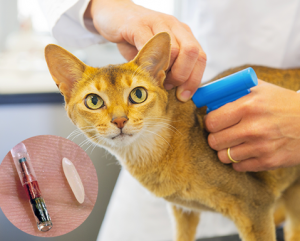 If your cat has a microchip implant, make sure to update regularly its information. For cats with collars make sure to place an identification tag bearing the old and new house address and contact details. We do not want to think of bad things happening but it is better if we are prepared for it. Print in advance lost cat fliers just in case kitty escapes and gets lost. It must contain a recent clear photo showing what your cat looks like, the cat’s profile and the owner’s contact details. This will save precious time in locating your cat and can spell the difference between finding her and losing her forever. Prepare a first aid kit in case of injuries. Have on hand the contact number of the emergency veterinary service in the new locality you are moving into. It is also best to have duct tape ready just in case the cat carrier gets broken. 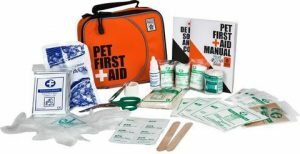 ALWAYS HAVE A PET FIRST AID KIT READY. On the day of the move, place your cat in the holding room with all her necessities and stick to her daily routine. If allowed by your veterinarian feed her a reduced amount of food but keep to her regular feeding schedule. Place a sign outside the room’s door informing the movers not to open this door without your permission. REMEMBER TO PLACE A WARNING SIGN ON THE DOOR TO AVOID MISHAPS. When it’s time to leave with the cat, check again the locks on the carrier before making your cat go inside. Place absorbent material on the flooring of the cat carrier and a favourite toy inside the carrier. Another good idea is to place a piece of clothing or bedding that has a familiar scent like a shirt or blanket before washing. Check that you have all the necessary documents on hand. During transit, talk to your cat in a gentle, reassuring tone. 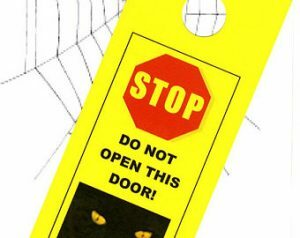 Resist the urge to open the carrier to check on or stroke your cat because this will give a scared cat the chance to escape. Open the carrier only if it is absolutely necessary or when you are already in your new home. In your new home, similarly, dedicate a room that is quiet and secure where you can place your cat for the next several days. Ideally, this room is away from the centre of the activity of moving in and the cat can rest there. Place in the room all of your cat’s necessities – food and water bowls, bed, toys, litterbox. You can additionally place inside this room a piece of furniture brought from your old home. The familiar scent will offer your cat an added feeling of security in this new and strange environment. 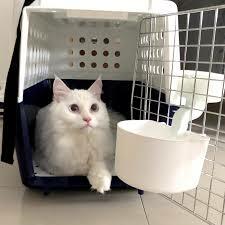 Place the cat carrier in the room and open the door. Do not force your cat to come out of the carrier. Let her do so in her own time when she feels safe enough. Keep the carrier in the same room so kitty can have a safe hiding place she can return to if she feels scared. Help your cat settle into new home gradually. Be patient and give her enough time and space to adjust. Stick to your cat’s daily routine as much as possible. Place treats in different areas of the room to encourage her to explore the room. Ideally, introduce your cat to your new home one room at a time. 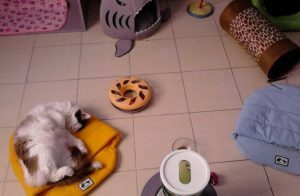 When you think your cat feels comfortable enough in the very first room then it is time to show her another room. When she becomes at ease exploring the rooms, move her litter box in small distances at a time to where you will want to eventually place it. If your work situation permits, spend several days with your cat in the new house to help her settle in before leaving her again all day. Your presence will make her feel at ease faster. Play familiar games with your cat. This will help dissipate anxious energy and help her feel relaxed in the new house. Placing cat tunnel toys may be helpful as it provides kitty with alternative hiding spaces. 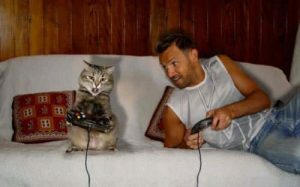 SPEND SOME TIME TO PLAY GAMES WITH YOUR CAT…WELL, MAYBE NOT THIS GAME, BUT YOU KNOW WHAT WE MEAN. Cats mark their territory by rubbing their cheeks on objects leaving their scent on these things. You can help your cat claim the new home as hers by rubbing her cheek with a piece of cloth and rubbing this cloth on objects that are at cat’s eye level. This helps her expand her territory faster. All pet cats should ideally live indoors. But if you want to let your cat outside, first keep her in the new home for at least three weeks to let her settle. When your cat looks already comfortable indoors and has marked her territory, introduce her outside on a harness. Your cat should be outside only under your supervision for the initial several times before letting her outside on her own. You can help your cat claim the yard as her territory by scattering her used cat litter to mark her scent. If your cat is outside on her own prematurely, she might walk all the way back to your old house and get lost on the way. 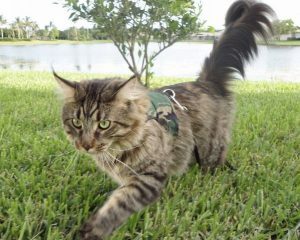 USE A HARNESS FOR THE FIRST SEVERAL TIMES YOU ARE INTRODUCING YOUR CAT TO THE OUTDOOR TERRITORY. Aside from the obvious signs of stress mentioned at the beginning of this article, observe for signs of passive reactions to stress. These include frequent withdrawal and hiding, crouching and immobility for long periods, ears often folded back and tail curled. Some cats, when stressed, rub their heads excessively on objects that it results in a bald spot between their eyes and ears. CROUCHING, EARS FOLDED BACK AND HISSING ARE FEW OF THE SIGNS OF STRESS. Despite all your efforts, some cats may still have a difficult time adjusting to change and settling in. 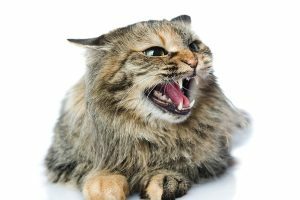 If your cat shows signs of either active or passive stress, do not shout at or hit her. Be patient and give her time to settle down. Reinforce good behavior by rewarding with treats and praises. If this does not help, ask for veterinary advice about seeing an animal behavior specialist. The topic of how to move house with a cat always involves some amount of stress. Be mindful of your own reaction to stress as animals are sensitive. Pets are very good at picking up the emotions of their humans. If you project stress feelings, your cat will feel the same way too. Believe that the problem of how to move house with your cat will go smoothly with good planning and preparation.